The Moon was once thought to hold the key to space exploration, as indicated by President John F. Kennedy’s famous Space-Race-era proclamation of the United States’ primary aim of “landing a man on the Moon and returning him safely on Earth.” In recent decades, the U.S. has largely turned its sights away from the Moon, looking instead at Mars and other celestial bodies. As a member of the baby boomer generation, I grew up believing that space was the final frontier and that by the end of my lifetime we would routinely travel to the moon and possibly other planets. Perhaps I was too optimistic, or I read too much science fiction. A permanent base on the moon didn’t happen but it should have. Lunar scientist Paul Spudis explores the reasons why the United States should consider a return to the moon: it is close, it is interesting, and it is useful. The book begins with a little background history on man’s fascination with the moon and leads into a discussion of the Apollo program. 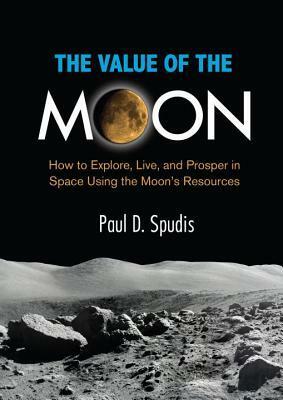 Spudis explains that our original reason for going to the moon was not space exploration, establishing a permanent base, or even research. Instead, it was a race to beat the Russians, to be the first country to plant our flag. Once we won the race, funding dried up despite the excellent research and information gathered during subsequent Apollo missions. The author goes on to look at the years following Apollo: Skylab, the Shuttles, the Space Station, unmanned space probes, and landing on Mars. He is skeptical that a mission to Mars is feasible right now and doesn’t think that is where we should be headed at this time. Instead, he makes a convincing argument on why we should return to the moon; why we need to return, because if not us, then who? It’s only a matter of time before someone else will. And the moon can be used as a base for future missions to Mars. He goes on to explain how we should go about getting to the moon and how to use the resources available there. While parts of the book can seem technical, it is written in a clear and understandable manner, and anyone with an interest in the space program should be able to enjoy the material. And I’m still hoping for that moon base in my lifetime. I’ve never been fascinated with space. All my friends would watch the launches but I was never interested. My dad woke me up to watch the first step on the moon but I kept wishing I was still in bed. Needless to say, this probably isn’t for me.